With the help of a modified Ford Escape, Thinkmodo's viral video team set up a stunt to bring attention to Car Lister, an auto-buying platform. 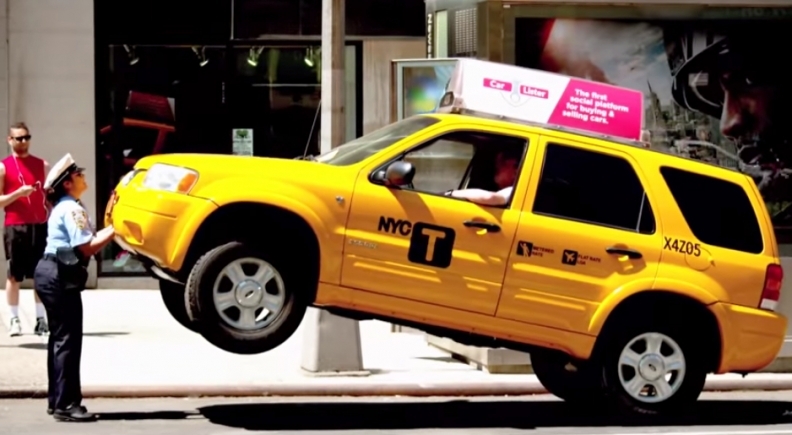 Using the Car Lister auto-buying platform is as easy as lifting the front wheels of a Ford Escape taxi off the ground. At least that's what the pranksters at ad agency Thinkmodo wanted you to believe in a recent stunt. Car Lister's CEO enlisted the New York viral-marketing agency to pull off a stunt to bring more visibility to the site, which allows dealerships and private owners to sell vehicles in a community-like setting with the help of photos and video previews. So Thinkmodo staged a dispute between a New York meter maid and a rude taxi driver who refused to move from an illegal spot. The two exchanged words until the exasperated maid, played by actress Jenni Ruiza, unleashed "superhuman" strength to lift the modified Escape taxi by its front bumper to stun onlookers. Yet it was all just a clever scheme to generate viral attention for Car Lister. The stunt illustrates the power of viral videos that spread rapidly online and are then picked up by TV shows for prolonged exposure. "It's easy to do [a viral video] once. It's not easy to replicate it. We're in the business of having to do it time and time again." The stunt has drawn national attention from the likes of NBC's "Today" and The Huffington Post. The video's original YouTube upload has passed 1.5 million views since June 15, while the campaign has earned more than 10 million views on domestic TV, according to the agency. Those numbers don't include millions of views collected from the legion of news outlets that embedded the video on their websites or from people who shared it via social media. "It's not just creating a viral video. Any video can go viral with a kid doing something funny. But it's creating a viral video that has a promotional purpose that's supposed to market something. That's where the challenge comes in," said Michael Krivicka, co-founder of Thinkmodo, which was formed in 2011. "To create something that goes viral but at the same time it's a marketing tool, an advertisement." Thinkmodo brought the Car Lister connection home at the end of the video by declaring in text, "That was easy," followed by "It's just as easy to buy & sell your car." The camera then zoomed in on the Car Lister sign on top of the Escape. Thinkmodo's other notable works include the golf hovercraft video starring PGA Tour pro Bubba Watson that brought publicity to the Oakley apparel company; a telepathic woman in a coffee shop to promote the remake of the horror classic Carrie; and a robotic devil baby that hyped spooky film Devil's Due. The Thinkmodo campaign is a way for Car Lister to think outside the box as it attempts to make a splash in car retailing -- an area that can be predictable with its marketing, says Bryan Harmon, the startup's CEO. Car Lister opened to dealerships in January. "Especially in this sector, they all kind of market and advertise the same way," Harmon said. "The same big boys do the same thing for the last 30 years and never questioned it." The Escape, outfitted with a Car Lister sign on top for exposure, was rigged with 5,000 pounds of counterweight in the rear of the crossover along with another 1,000 pounds in the bumper. The transmission, engine and drivetrain were removed to make the front of the vehicle easy to lift. Custom fabricator A2ZFX, which needed around two months to alter the Escape, has built or converted vehicles such as the Batmobile from the 1997 movie Batman & Robin and the Mini Coopers that are adorned with giant Red Bull cans for promotional purposes. Thinkmodo's business model relies on launching a video on the Web and then capturing more attention through TV coverage. "It's easy to do [a viral video] once. It's not easy to replicate it. We're in the business of having to do it time and time again," said James Percelay, Thinkmodo's co-founder. He added: "It is a lot of pressure because it's very transparent whether it's a success or not. With a TV commercial, you don't know how many people are watching or how many are not because you've bought the media. In our case, you see the numbers on the bottom of the YouTube [video] so you know exactly what the count is." Thinkmodo's business model is predicated on launching a video on the web and then capturing more attention through TV coverage. Thinkmodo has to protect the surprise element of its productions during filming, a tough task in a smartphone era when people can quickly record videos or take pictures and post them on the Web. The agency can't let pieces of the productions leak out and go viral before the main event. To stop people from recording Thinkmodo shoots, the agency deploys production assistants who look out for people who have their phones out. During the meter maid filming, an assistant spotted a group on the third floor of an office building with their phones out to capture the action. Thinkmodo had to speak with the office manager to get everyone to put their phones away. Thinkmodo explained to them that any leaks before the agency posted its video could undermine its work, Percelay said. The director is the only person who is allowed to say 'cut' during normal productions such as movies and commercials, but Thinkmodo is unique in this area because they have to be so careful. Percelay said, "A production assistant can say 'cut' on our shoots because we know they're doing it because somebody is filming us."